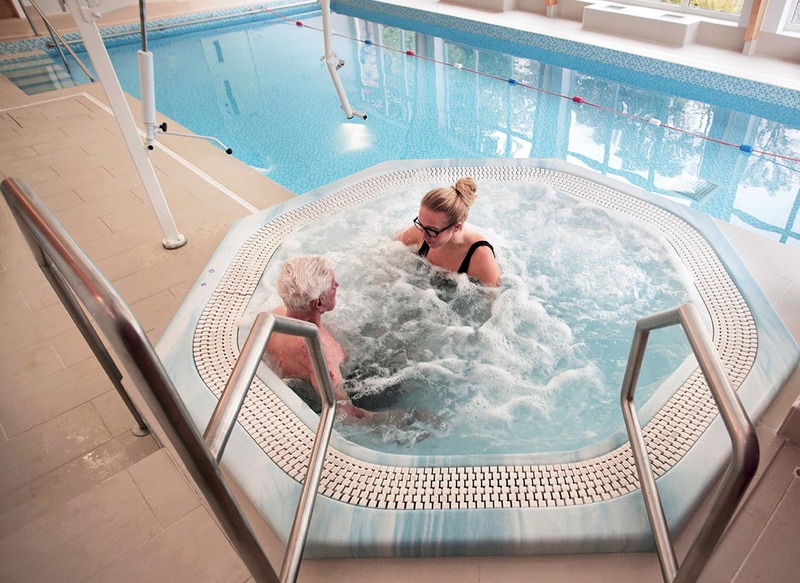 Middleton Spa not only provides a sociable hub but supports residents and local non-residents in maintaining and enhancing fitness. Healthy Living Advisors are experienced in working with older people and are effective in helping people to achieve their aims. These may be to improve their strength and agility, undergo rehabilitation following illness, injury or surgery, or simply to enjoy the feeling of good health. Advisors meet all new members, assess their basic health and aims, and then complete a PARQ (Physical Activity Readiness Questionnaire). Members undergo a full induction and can either undertake activities independently and ask for advice informally, or work on a one to one basis. A 10m length, 1.2m deep swimming pool that is maintained at a very pleasant 30.5 degree temperature. Non-swimmers and swimmers both enjoy gentle exercise, classes or therapy sessions. A hoist is available for those who have difficulties entering and exiting the pool. The Atrium – a light and spacious area with sofas. Perfect for meeting friends or relaxing with a magazine.